Special to Tribune Chronicle Canfield’s Nick (left) and David (right) Crawford have spent years wrestling one another and, yes, broken some furniture along the way. 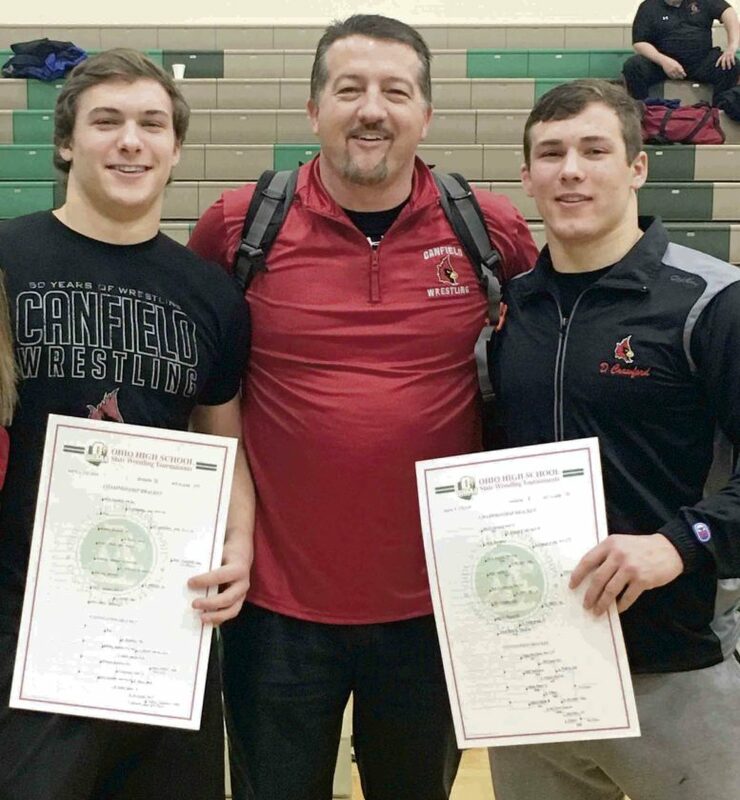 The two, with their dad, Dave (middle), proudly takes a picture as his two sons represent the Cardinals at the state wrestling tournament in Columbus. CANFIELD — Couches, family vacations and unblemished walls don’t stand a chance with the Crawfords. Not for the last 10 to 12 years, at least. Three rambunctious boys have been finding different ways to damage the house, and change vacation sites, since they were old enough to put one another in a headlock. And considering the man of the house, Dave Crawford, is a former college wrestler, headlocks started pretty early. Not much has changed. The brawls just happen inside a wrestling room, where the walls are padded and couches are few and far between. Tribune Chronicle / Joe Simon Nick Crawford, top, is controlling Aurora’s Colin McNamara during Saturday’s Division II district wrestling tournament in Alliance. Nick and David are pretty good brawlers, too. They each won both sectional and district titles over the last two weeks. 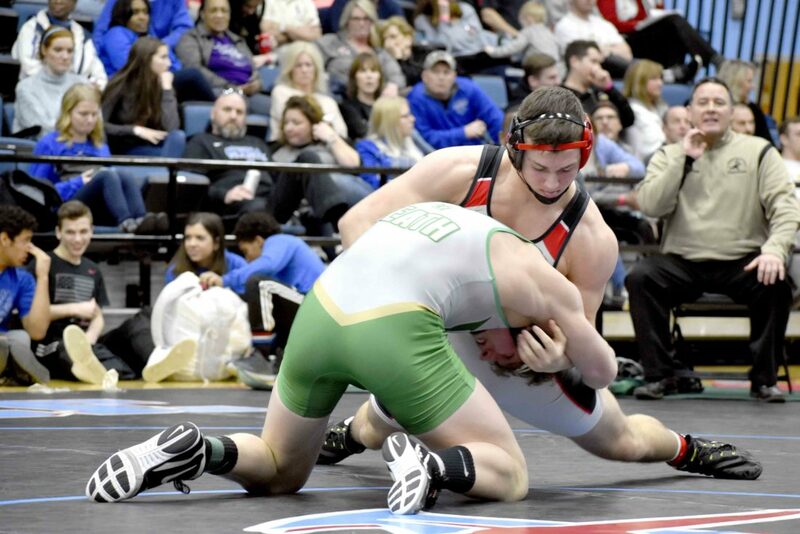 David is a returning state champion and the top-ranked Division II wrestler in the 182-pound weight class. Nick is participating at the state level for the first time, but is ranked as high as sixth in the state at 195 pounds. The duo (along with their younger brother, Michael, who’s an eighth-grade wrestler) seemed destined for wrestling success since they were children. Even mom could see the potential. Fortunately, dad helped them channel that aggression toward something constructive. A former football player and wrestler at Mount Union, Dave has been coaching wrestling for more than 25 years. 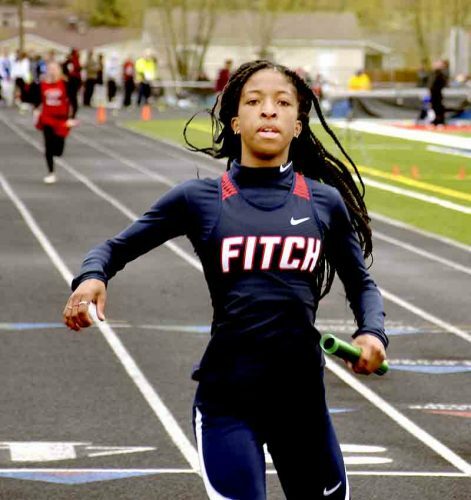 He started at Austintown Fitch in the early 1990s before he and his family moved to Canfield. He’s been coaching at the youth level for much of his time with the Cardinals, but he also works with the junior high and high school. Tribune Chronicle / Joe Simon David Crawford, right, is wrestling David Heath of Akron St. Vincent-St. Mary at the Division II district wrestling tournament at Alliance High School. He was in his boys’ corners during this past weekend’s district tournament, and seeing his two oldest sons qualify for the state tournament togher was an experience even a tough guy couldn’t help but get worked up over. Dave admits Saturday was a special day, and it’s one of many he’s enjoyed over the past few months. Both David and Nick also were key contributors on Canfield’s football team, which reached the regional final this past season. The fun is only beginning for the Crawfords. 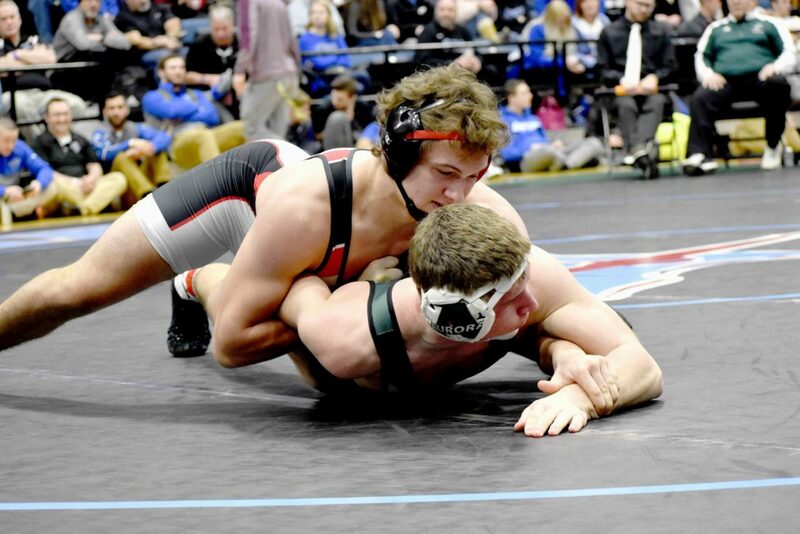 David, who is attempting to become the first Canfield wrestler to win back-to-back state titles, is committed to wrestle at the University of Pittsburgh. Nick, as mentioned, is just a sophomore, and Michael, who’s preparing to wrestle at next weekend’s junior high state tournament, still has four years of wrestling — maybe more — in front of him. The elder statesman of the Crawford boys, David hopes he took the right approach with Nick, one that he can carry over to Michael. Nick and David have fierce battles during practice, and while tempers may flare, they’re back to being brothers when it’s over. That, and the fact that they know each other’s wrestling styles so well, help them improve in a rather tumultuous manner. They motivate one another as well. Nick, who wrestles directly after David because his weight class follows his older brother’s, had one of his best performances of the season Saturday, when he beat Colin McNamara of Aurora, 5-1, for the district title. He said his David’s victory a few moments sooner, which came against one of his top competitors, inspired him. Ah yes, the little brother complex (aka. always wanting to one-up bigger brother). It’s alive and well in the Crawford household, just like couch-jumping, royal rumbles in the basement and vacations to places that aren’t exactly vacation-like. Michelle, like her boys do in the basement, just rolls with the punches. She knows her time is coming. “Some day I’ll get to go to the beach,” she said with a laugh. As for the couches, tables and walls, well, she’s also learned a lot about warranties over the years. They never stood a chance against the Crawford brothers.